Anita Rani, born on October 25th, 1977 in Bradford, West Yorkshire is an English radio and television presenter, journalist and broadcaster. 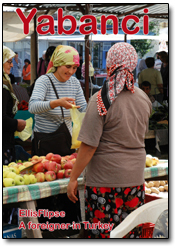 Her mother is of Sikh origin, and her father is of Hindu descent. Whatever the mix of ethnic heritages were, they worked extremely well together and made Rani the very beautiful and talented woman she has become. At an early age she developed an interest in journalism and hosted her first show at the age of only 14 on Sunrise Radio in Bradford. Rani was educated at Bradford Girls Grammar School, an independent school in the town of Bradford and later entered the University of Leeds, where she studied Broadcasting. After leaving university, Rani worked as a researcher for the British Broadcast Corporation (BBC) and other organisations. In the year 2002, Rani presented The Edit, a live news and entertainment program on Channel Five in the UK. With her passion for music and argument, Anita was a natural on air talent, and was made the face of Street Beat for UK Play. She has also presented a number of pop shows on Five including Spring Break Live, Party in the Park and Pop City Live, as well as being a freelance journalist for Five News. In Spring 2003 she hosted The State We're In, a satirical current affairs program on BBC 3. She also presented the first Poetry Slam on that same channel and was nominated as Best On Screen Personality at the Royal Television Society Midlands awards in 2005. Rani joined the BBC Asian Network radio station in March 2005 where she became presenter of the weekend Hot Breakfast show. 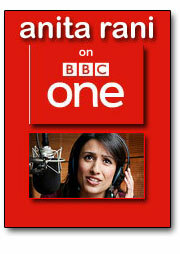 From April 2006 to March 2007 she presented the weekday morning talk program Anita Rani on the BBC Asian Network. Since the 20th of May 2006, Rani has been a co-presenter of Desi DNA, an arts program on BBC 2. She was also part of the launch team that presented Destination Three, a late night entertainment zone on BBC 3. In 2005 she was also a regular reporter on The Cricket Show on Channel 4. In May 2006 she joined Sky Sports where she became co-presenter with Simon Thomas on the Cricket AM Show every Saturday morning. Rani presented My Generation Next, shown on BBC News 24 between the 2nd of December and the 9th of December 2006. She covered for Anita Anand on the late evening weekday show on BBC Radio Five Live in March and September 2007 and has presented World Have Your Say on the BBC World Service and Weekend Breakfast on Five Live. She has also covered on various shows for BBC 6 Music. In August 2008, she was the co-presenter of Rogue Restaurants on BBC 1 where she unearthed filthy conditions in local eateries, and Make Me White, a fascinating documentary which saw her investigating skin lightening within the Asian community. The market for skin lightening cosmetics is reported to be worth millions and Rani went on a journey to discover the facts behind this controversial phenomena. She started in her own family acknowledging her own mother’s preference for lighter skin and went on to explore the pressures within the Asian community that have lead to a growing number of individuals choosing to lighten their skin. Special skin lightening cosmetics are available both legally and illegally worldwide with many of these illegal creams containing banned chemicals which pose health risks and possible irreversible skin damage. Anita went undercover to see how easily available they are and took a hard look at the cosmetic distributors and lifestyle magazines that promote and advertise skin lightening products. She joined the team of roving reporters on The One Showreporting on heartless online dating scams, uncovering landlords who were cramming desperate tenants into cramped and dangerous properties, helped rally a mass street clean up project as well as reporting live from Liverpool where giant marionettes were roaming the city as part of the city Titanic centenary events. As the current affairs correspondent for the show Anita tackled the latest issues affecting the nation - whether that is the life of victims of forced marriages or investigating the difficulties facing the over elderly people in the workplace. From the 2nd of March 2009 she appeared on the BBC 1 Watchdog as a new co-presenter, replacing Julia Bradbury. In 2011, Anita presented Four Rooms, a program where unique items are brought in to specialist dealers to see who offer the highest price for these items. The year 2011 also saw Anita land the much sought after role of presenting the Royal Wedding coverage for BBC 1. She was given the prime spot outside the Goring Hotel where Kate along with the rest of Middleton family were staying and from where she left to go to Westminster Abbey. Rani co-presented with Justin Rowlatt the two part documentary travelogue India on Four Wheels, a road trip around India sampling the changes and problems the increased auto usage has brought to the country in the last two decades. She collaborated with Rowlatt on a follow up two-part documentary entitled China on Four Wheels, which aired on the 9th of September 2012 and on the 16th of September 2012. In How Safe are Britain's Roads she and Justin Rowlatt explored how safe the roads and cars of Britain are and what can be done to cut casualties. They discovered that most accidents are caused by human error and what kinds of errors are the biggest killers on the roads. They consider the dangers of mobile phones and how they compare to alcohol consumption or lack of sleep when driving. And whether some people are more prone to accidents than others. Research suggests men and women crash in different ways, likewise the young and the old. Justin and Anita got the scientists out of the lab to carry out tests on the Great British public. They used what they found to examine current proposals: should there be re-testing of the elderly or a ban on the young from driving with friends? The program explored what's behind the statistics through access to unique video collection of drivers caught on camera during accidents and in near misses, showing their errors as they happen - including one of Justin and Anita's own errors. Also in 2012, Anita participated in the BBC Great Sport Relief Bake Off, and won the competition. Beautiful and talented British radio and television presenter, journalist and broadcaster Anita Rani has her own program on BBC One. She has done numerous documentary pieces in the UK, India and China and can be seen on Four Rooms on BBC One... Click here to visit her profile on the BBC.